Posted on 11 April 2010. Nestled on the fringe of Nusa Dua Bali, beside the sandy golden Tanjung Benoa Beach, the southern peninsula of Bali, Novotel Coralia Benoa Bali is only a twenty minute drive from Bali’s international airport. A Bali’s traditional fishing village is just one kilometer from the resort, where colorful ceremonies and rituals are a part of the daily life. The coconut wooden building structure and traditional thatched roofing combine to create an atmosphere of cool tropical comfort. 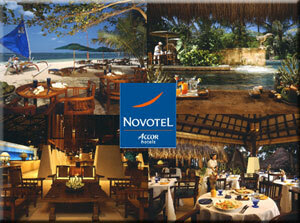 The resort offers a Balinese village atmosphere using thatch roofing in a low-level design. Individual rooms are very well designed and they all have either a balcony or a small garden. The ultimate in accommodation are the 12 exquisite Beach Cabanas, blending contemporary and traditional Balinese designs. 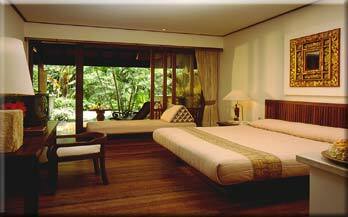 Each has its own private sunning garden and a Balinese open air bath tub, with a separate shower.